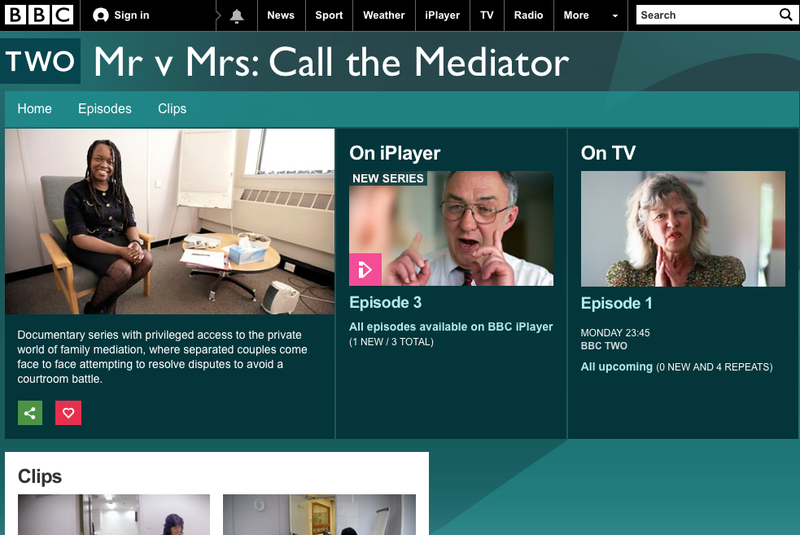 Janet Smithson watches 'Mr v Mrs: Call the Mediator' on BBC Two. This series follows ex-couples going through family mediation after a relationship breakdown. We hear each person’s side of the story, and their mediators’ attempts to help them resolve their disagreements. A mediator describes the challenge: ‘to reach a compromise that both sides can bear’ – but they are also supposed to aim for an outcome in the children’s best interests. First we meet Sue and Peter, arguing about how to split their finances after a 28-year marriage. Peter objects to ‘the morality of it’ as Sue is now living with another man – his old boss. We also meet Martin and Nicola, arguing about whether and how Martin can see their young children. He feels ‘It’s a vendetta against me’. The third couple in episode 1, Jason and Victoria, are ‘high conflict’, trying to co-parent their daughter. They are attempting ‘shuttle mediation’ – we see the mediator, Irene, going to and fro along a corridor while they are in separate rooms. As one of the mediators explains it: ‘My job as a mediator isn’t to impose a solution but to try and help them come up with one themselves.’ The programme demonstrates how this is both a strength and weakness of mediation. The psychological aspect of separation and negotiation comes out strongly here, and we can see why the decisions about property, money, parenting and child contact are highly emotionally charged. We can also observe how tricky it is for the mediator to demonstrate neutrality (a core mediation value) while parties argue bitterly. Many of the participants in our study of family mediation (Barlow et al., 2014) complained that the mediator was biased to their ex-partner, and we see in these episodes how difficult this can be in practice. We also see what we have termed a lack of ‘emotional readiness’ – people may be hurting too much to negotiate successfully yet. The end of the episode summarises the success, or not, of the process. In the first episode, only Sue and Peter, in a dispute about money, came to an agreement. Victoria and Jason reached an agreement in court about child contact, and Martin and Nicola were still disagreeing. Episode 2 shows a similar pattern. Of the three couples, only the couple dealing with property and financial agreements agreed an outcome. The programme demonstrates how difficult it is to overcome psychological hurt and make ‘rational’ decisions, and in particular for the ‘high conflict’ couples – our study similarly found that mediation typically breaks down in these cases. However, as one mediator says: ‘Success in mediation doesn’t look the same for everyone. For some it’s an agreement they can take to their lawyer and have made legally binding. For others, it’s starting to be able to speak to each other.’ The series provides a realistic picture of the family mediation experience – psychologically fraught, not always successful, but one way of attempting to communicate and resolve disputes without going to court. Barlow, A., Hunter, R., Smithson, J. & Ewing, J. (2014). Mapping paths to family justice: Briefing paper and report on key findings. University of Exeter.